When you want to replace original timber sash windows with a more modern uPVC alternative, attention to detail is imperative. To ensure authenticity, every element of your new windows needs to be in keeping with your property’s individual character. Many installers look at the window frames and glazing and if they’re a realistic reproduction, then they’re happy. It can be all too easy to overlook the finer points of a windows’ manufacture. Window hardware such as handles, stops, and fasteners make the difference between a mediocre reproduction and an authentic window design. Fortunately, at Roseview, we take our sash windows seriously. We’ve spent decades designing and developing our uPVC sash windows to ensure that they look as close to the traditional timber originals as possible. 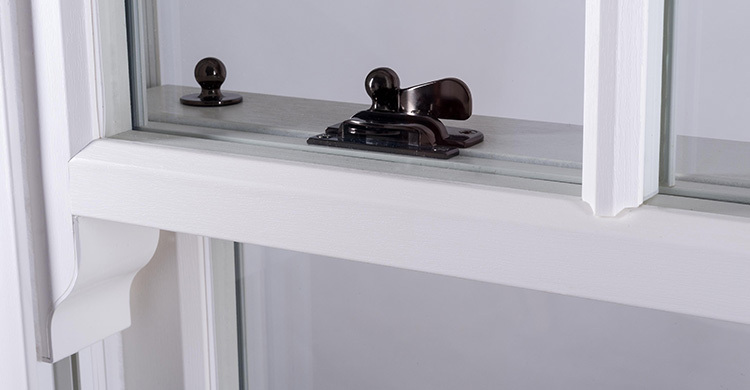 Here are some of the hardware options that we use to make sure that our uPVC sash windows are the real deal. The Rose Collection uPVC sash windows can be fitted with either Globe Claw or Acorn furniture depending on the window suite you choose. The Ultimate Rose windows are fitted with Globe Claw furniture while both the Heritage and Charisma Rose have Acorn locks as standard. All our locks are available in several metallic finishes: gold, chrome, bronze, and satin. Acorn locks are also available in white while Globe Claw locks can be finished in antique black. When it come to authentic limit stops, all our windows can be fitted with either Angel Stops, Shark fins, or Rola limiters. Depending on your desired window aesthetic, there’s sure to be the perfect window furniture to suit any style of home. All these features when combined with attractive and authentic hardware combine to create a truly stunning sash window. When you want to give your customers the best uPVC sash windows, choose the Rose Collection. For more information call 01234 712 657 or contact us online.